Here's what stared at me from the front page of my daily paper recently. 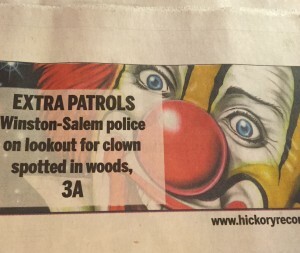 From Adam K. Raymond at the Daily Intelligencer, here's a recent update: "Creepy Clowns Are Still Terrifying People Across the South." What do we know? We know that evil clowns are a thing, both in real life (think John Wayne Gacy) and in many, many forms in fiction, from the Joker himself (who first appeared in 1940) to Twisty the Clown in American Horror Story: Freak Show (2014-2015). This brings up a question I'd like to ask all of you. What's the first thing you think of when "evil clown" is mentioned? I immediately think of the clown doll in 1982's Poltergeist. Aside from the Joker, I think that was my first encounter with the evil clown phenomenon. We also know that fear of clowns is prevalent enough to warrant a term: coulrophobia. As the Great Clown Panic continues, I recommend checking out the documentary Killer Legends (2014). (We streamed it from Netflix.) This film examines the origins of four urban legends, the last of which is the evil clown panic/phantom clown phenomenon, which can be traced back in the United States almost four decades. There's some fascinating material in the analysis. Here's the trailer. And there's this new article from Jesse Walker, also worth a look: "Friday A/V Club: A Short History of Phantom Clowns: This isn't our first freakout about imaginary Bozos." "They're roaming the streets, stalking our farmer's markets, diminishing our helium supply...and yet police say there's no way to stop the nomadic, peaceful-but-creepy clown menace. "One serious hindrance to law enforcement has been the fact that these clowns, often, do not literally exist. Or, if they do, no tangible evidence of their existence can be found. But that doesn't make them any less real to the residents of places like Greenville, South Carolina, where media is now warning that candy-bearing clowns are trying to lure children into the woods. "Several children, teens, and at least one mother living at the town's Fleetwood Manor Apartments claim they've spotted a 'clown or person dressed in clown clothing' in woods near the complex, sometimes doing things as benign as standing alone and waving hello while other times gathered en masse waving knives, chains, candy, money and green lasers. As clowns do." Current Music:"American Horror Story Theme"
(in thinking on this some more.....I think you could really expand on this whole theme of evil in the form of a clown .....especially in view of real life evil clowns (like Gacy)....clowns, who traditionally are funny figures....and yet, they are not *benign* funny figures, are they? In circus acts, they typically are rather mean-spirited, finding a humor base in being aggressively debasing to their fellows. That, and the fact that they 'mask' their behaviors and faces beneath a mask of (generally) a perpetual (and fake) smile, lends a horror to them. We cannot trust someone who perpetrates bad while never changing expression, who hides the 'truth' of their being behind a never-changing Happy Face. I agree 100% with what you're saying about them not being benign. They're either mean-spirited, or there's something *off* - for example, the sad clowns with tears on their faces that we're supposed to laugh at. Uncomfortable and wrong! We cannot trust someone who perpetrates bad while never changing expression, who hides the 'truth' of their being behind a never-changing Happy Face. I'd forgotten "The Beast Below"! Great catch. I think it's bizarre that the media is assuming that these phantom clowns seen in/near the woods are supposed to be there to lure children, given that children (and everyone else) seem to be afraid of them. If they're seen in/near the woods, isn't the natural inclination to run away, to go in the opposite direction of the woods? Who knows. well, perhaps they are they to lure very fey children indeed; children who will, in future, *be* the clowns of the wood. ****wait, did we mention Insane Clown Posse? Or Buckethead? isn't he sort of clown-ish? In particular, beware the pantsless variety of Creepy Clown. Another form of children's entertainment which regularly gets portrayed as creepy are ventriloquists. With the exception of Edgar Bergan, popular entertainment just about always depicts them as sinister. Ha! Seriously. That's an extra-creepy Creepy Clown. Great point about ventriloquist dummies! (My mind went immediately to "The Dummy" episode of The Twilight Zone.) You're right, they're nearly always portrayed as evil. And like clown dolls, they seem to be very mobile, too, for inanimate objects that shouldn't be able to move. The regional legends are some of my favorites for creepiness in October. Dear to my heart is the Boggy Creek monster who also prowls the mountains of southeast Oklahoma near Honobia. Remember he always travels the creeks! :) When I hear "evil clown" I think of Stephen King's IT. The clown on the cover and in the book gives me shivers and is very haunting. In a sickening way, I also think of John Wayne Gacy. And the current Clown Panic is truly bizarre! And nobody sees the flowers bloom but me..."
Oh, great call re: Stephen King's IT. I haven't read it, but I'm thinking I should, right? The image of Pennywise is so iconic, though, I can see him in my mind's eye perfectly. I have to think this current scare is, like it was back in the 1980s, mostly a case of mass hysteria. So many of these so-called sightings can't be confirmed, after all. Still, it makes you wonder: why now? Why do some places experience it and not others? Like you said, it's bizarre. I second the commentor who named Pennywise, the murderous clown from King's IT. Absolutely the scariest element of my childhood. Best of luck with your clowns, Amy. Hey, if you can't beat 'em, join 'em? Best of luck with your clowns, Amy. Hey, if you can't beat 'em, join 'em? I also think of Pennywise from IT when I think of evil clowns. Supernatural also had a funny/scary clown episode. Pennywise seems to be the winner here. Oh, good catch re: Supernatural! Strangely enough, I also think of Pennywise, despite never having watched or read IT! Another vote for Pennywise! That image is so iconic, I know what you mean: you don't have to have read the book or seen the film to know that creepy face! I can't remember a time when I didn't think that clowns were creepy. But if I had to chose the first thing I think of when "evil clown" is mentioned, it would have to be the One Step Beyond episode called, coincidently enough, The Clown. I was six or seven when I saw it, and it scared me silly. Oddly enough, the clown isn't the actual villain. I'm with you, by the way. I don't remember a time when I didn't associate clowns with creepiness!